Probably one of the most popular taglines of modern times. A brand that most men look up to for their grooming needs. But do you know about the man behind the invention of the first safety disposable razor that laid the foundation for this brand. And do you also know that this inventor hoped that he be remembered as one of history’s social and economic reformers. 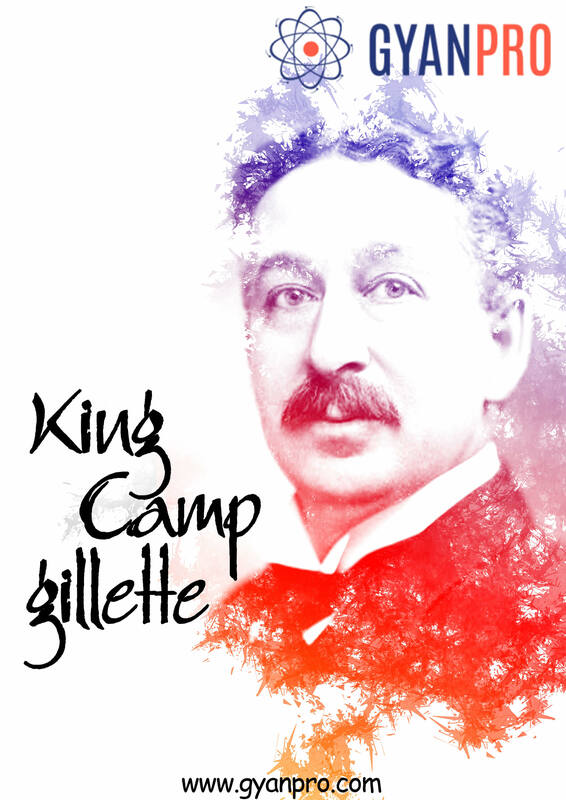 His name was King Camp Gillette. Before we know more about this messiah of men’s grooming, let’s acknowledge one of the most significant problems that troubled society. Shaving was considered as a nuisance and sometimes even dangerous prior to the beginning of the 2oth century. Young Gillette moved to Chicago, Illinois and was raised and educated there. He and his siblings were always encouraged to work with their hands to figure out how things worked and how they might work better. He moved to Kansas City, Missouri, where he worked as a travelling salesman when he was 21 years old. He became quite a successful travelling salesman. Gillette and William Painter, the inventor of crown cork bottle cap and bottle opener had a close personal and business relationship; working for him at Crown Cork and Seal Company, is where he got his inspiration to create a product that would be disposable after use, so that the customers would keep coming back for more. In 1894, well known in the radical political circles Gillette, an anti-capitalist, finished The Human Drift, a book containing his ideas and a political views of his utopian world. In 1895, when he first conceived the idea that would change his life, Adams wrote, “One early spring morning while in the midst of shaving, his face well slathered with warm soap, he [Gillette] had conceived the disposable razor blade.” That same day Gillette rushed to a hardware store and bought some bought steel ribbon, some pieces of brass, files, and a small vise, and began making a model of his idea. After four summers, on August 11, 1899, he filed for the first patent on the device calling it ‘new in the art of razor manufacture and use’. The technical experts told him that it was hard to manufacture thin sheets of sharpened steel, cheap enough to make disposable blades. He went to the Massachusetts Institute of Technology, where he partnered with William Emery Nickerson. Nickerson had developed the necessary design and machinery to produce the razor blades, while Gillette had secured the necessary financial backing. Now you see me! Stepping into the light – the Story of DeWitt Bristol Brace. An Invention that Shocked the World – The Story of Joseph Erlanger. Newton’s Rediscovery of Gravity! !